In contrast records management software is used to ensure that content which must be kept for specific periods of time is indeed kept for that length of time. It ensures that correct content is used throughout the organization and perhaps most importantly. It is responsible for ensuring that content is moved, approved for disposition by the correct people and eventually disposed of at the appropriate time. This ultimately helps the company recover in the event of a legal disaster. Saving everything forever can create significant storage cost. It takes money to pay for both physical and electronic storage. It takes money to pay for handling and management of the content items too. Each time a box of old invoices is moved, more money and time are invested to maintain its existence. Every square foot of storage space is purchased or leased, taxed and sometimes heated and cooled. Likewise, every byte of data is stored, backed up and maintained on a hard drive somewhere. Overall, there’s a larger than expected “hidden” cost associated with storing every piece of content the company owns regardless of whether the item is printed and stored in a file cabinet or whether it is stored electronically on a network. As the number of content items increase, the cost of carrying those items increases. keeping everything forever guarantees that a company’s cost of content will increase perpetually so there is a need for reducing content “disposition”. In fact many companies simply “keep everything forever.” companies don’t have a tool to insure compliance across the organization, keeping everything forever quickly becomes the easiest and most often implemented The challenges of categorizing the content, finding it when needed and disposing of it at the right time simply require too much effort so there is a need for “retention policy”. There may be different versions of the same document. Imagine a manufacturing company and there may be assembly or installation instructions for a product. Perhaps an incorrect installation will fail to meet a specific government regulation. In these cases it is critical that only the most recent installation instructions are used. Expanding number of software systems holding important content so there is need for “single and federated search”. 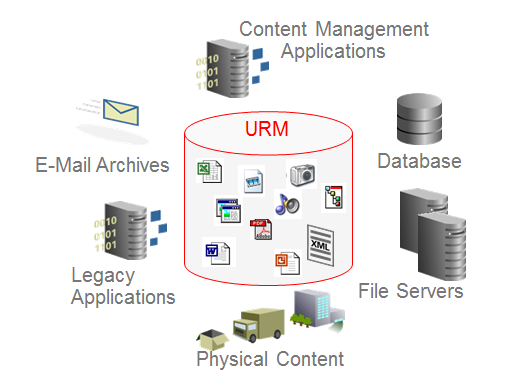 This entry was posted in ECM, Oracle ECM, UCM, URM and tagged Adabter, content, contrast records, disposition, electronic storage, federated search, oracle webcenter, record management, records, records management software, retention, Storage Sollution, UCM, URM, webcenter content. Bookmark the permalink.